President-elect Donald Trump, whose campaign railed against his “crooked” political opponents, has become embroiled in a Hollywood-like conspiracy scandal after BuzzFeed published an explosive but unverified dossier alleging that Vladimir Putin’s Russia has been “cultivating, supporting and assisting” him. Should the allegations prove to be true, it could be disastrous for Mr. Trump’s presidency. Here The World Weekly unpacks where the dossier has come from, what it says, and what ramifications it may have with a week to go until he takes the oath of office. Where has the dossier come from? The origins of the so-called Buzzfeed dossier read like the plot of a John Le Carré spy novel. In the midst of last year’s turbulent election campaign, Christopher Steele - a former British MI6 officer who served undercover in Moscow during the early 1990s and now runs London-based Orbis Business Intelligence - was contracted to compile a body of research on Mr. Trump’s suspected ties to Russia. Mr. Steele was initially hired by a Washington-based investigation firm, Fusion GPS, which had been contracted by a major Republican donor to investigate Mr. Trump during the primary season. When Mr. Trump became the presumptive nominee, Republican funding of the operation halted. But the case was picked up by Democratic supporters of Hillary Clinton, who employed Fusion GPS to compile “opposition research” on Mr. Trump. Unable to travel to Moscow himself, Mr. Steele began to contact informants within Russia indirectly, collecting information and writing up his findings in a series of memos which he delivered to Fusion GPS up until December. He continued to work on the case after Mr. Trump’s surprise victory in November, despite not being contracted by a client. Last summer, rumours of a Trump dossier began to spread throughout Washington. After reports of Russian hacking of the Democratic National Committee circulated in June, Mr. Steele passed his findings to contacts in the FBI. By early autumn, Mr. Steele’s memos had been passed to prominent journalists. After the election, the dossier was apparently common knowledge in Washington, and journalists were rushing to verify the allegations. In mid-November, the Guardian reports, the annual Halifax Security Forum opened in Canada, bringing together security and foreign policy officials from around the world. Senator John McCain, chairman of the Senate Committee on Armed Services and one of the most outspoken Republican critics of Mr. Trump during the campaign, was present, and was introduced to the documents through a “former senior western diplomat” who believed them to be credible. Mr. McCain, apparently alarmed by the implications of the dossier, sent an official to meet the source and discover more. The official boarded a transatlantic flight and met the source at an unnamed airport. Within 24 hours, he flew back and showed Mr. McCain the documents. The senator allegedly said he was reluctant to get personally involved, fearing that he would be seen as carrying out a vendetta against Mr. Trump over inflammatory comments the tycoon made during the campaign. On December 9, Mr. McCain arranged a one-on-one meeting with James Comey - the FBI director who has come under widespread criticism for revealing that his agency was investigating Ms. Clinton in the week before election day - and handed over the dossier. The FBI subsequently included the documents as an appendix to their well-publicised briefing of alleged Russian attempts to influence the outcome of the election, which was presented to President Obama, Mr. Trump and high-ranking members of Congress on January 6. Mr. Steele reportedly fled his Surrey home this week, seemingly in fear of his life. In a series of explosive claims, the dossier describes two alleged Russian operations surrounding Mr. Trump. The first was a long-running, state-ordered effort to find a way to influence Mr. Trump. The New York Times speculates that this operation began because Mr. Trump had contacts with Russian oligarchs on whom Mr. Putin sought to keep tabs. To assert influence on Mr. Trump, the Russian Federal Security Service (FSB) apparently employed a range of tactics, including the gathering of ‘kompromat’ - compromising material - which could be used to blackmail him. According to Mr. Steele’s dossier, this includes tapes of Mr. Trump performing lewd sexual acts with prostitutes in Moscow’s Ritz-Carlton hotel. Second, Mr. Steele described a series of contacts between Moscow and Mr. Trump’s representatives during the campaign. In part, these contacts were made to discuss the hacking of the DNC and the Podesta leaks. The dossier claims that Mr. Trump’s personal lawyer, Michael Cohen, was the point-man for secret meetings with members of the Russian leadership (which have been stringently denied), and that Carter Page, a former foreign policy adviser to Mr. Trump, visited Moscow in July 2016 (which has been verified). In Moscow Mr. Page met with Igor Sechin, President Putin’s de facto deputy. The report says Mr. Sechin indicated that future US-Russian energy deals were dependent on the Trump administration’s willingness to lift sanctions on Russia, imposed by Mr. Obama after the annexation of Crimea in 2014. Mr. Page has denied this was the intention of his visit. Nonetheless, the close links some members of Mr. Trump’s nascent cabinet have with Moscow will do little to quell concerns that the new administration is too cosy with Mr. Putin. 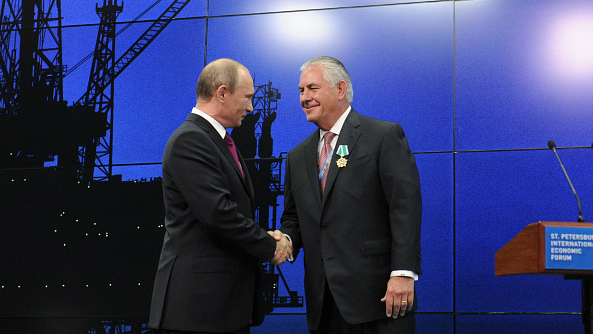 Rex Tillerson, nominee for secretary of state and outgoing CEO of energy behemoth ExxonMobil, was bestowed an Order of Friendship by Mr. Putin in 2013. Two years earlier, he approved a deal to give his company access to drilling in the Russian Arctic in return for granting state-owned Russian oil giant OAO Rosneft the opportunity to invest in ExxonMobil’s overseas operations. According to the BBC’s Washington Bureau Chief, Paul Wood, Mr. Steele is not the only source for claims about Russian ‘kompromat’. Mr. Wood reported that back in August a retired spy told him that he had been informed of the dossier’s existence by “the head of an East European intelligence agency”. Mr. Wood later used an intermediary to pass questions to active CIA officers dealing with the case file. He received word - indirectly - that there was “more than one tape”, “audio and video”, on “more than one date”, in “more than one place” - in the Ritz-Carlton in Moscow and also in St. Petersburg - and that the material was “of a sexual nature”. Unsurprisingly, Mr. Trump dismissed the accusations levied against him as “fake news”, first on Twitter and then in a press conference on Wednesday, likening Buzzfeed and CNN to Nazi Germany in their willingness to spread misinformation. There is an enormous amount of doubt as to how Mr. Steele accessed information that could only have come from the upper echelons of Kremlin leadership - access many commentators doubt he has. However, British intelligence officials (including former colleagues of Mr. Steele) rushed to vouch for his credibility on Wednesday, describing him as “an experienced and highly regarded professional” who spearheaded MI6’s response to the poisoning of Alexander Litvinenko in London in 2006. If these incendiary allegations are proven accurate (at this stage, a long way off), it would leave the US in uncharted waters. The leak of this suspect dossier, alongside earlier accusations of Russian-directed meddling in the affairs of Ms. Clinton and the DNC, has already cast a shadow over the legitimacy of the country’s democratic process. It is likely that a Putin-shaped cloud will linger over the White House long beyond Inauguration Day.